On a stifling August day in 2002, Alexandra Lind is thrown several centuries backwards in time. She lands at the feet of Matthew Graham – an escaped convict making his way home to Scotland in this the year of our Lord, 1658. Matthew doesn’t quite know what to make of this concussed and injured woman who has seemingly fallen from the skies. What is she, a witch? Alex gawks at this tall, gaunt man with hazel eyes, dressed in what to her mostly looks like rags. At first she thinks he might be some sort of hermit, an oddball, but she quickly realises the odd one out is she. Catapulted from a life of modern comfort, Alex grapples with this new existence, further complicated by the dawning realisation that someone from her time has followed her here – and not exactly to extend a helping hand. Potential compensation for this brutal shift in fate comes in the shape of Matthew – a man she should never have met, not when she was born three centuries after him. He quickly proves himself a willing and most capable protector, but Matthew comes with baggage of his own, and on occasion it seems his past will see him killed. At times Alex finds it all exceedingly exciting, longing for the structured life she used to have. How will she ever get back? And more importantly, does she want to? Book 1 of the Graham Saga, published on May 11, 2017. Delighted with this Chill Award! Honoured with a BRAG Medallion! 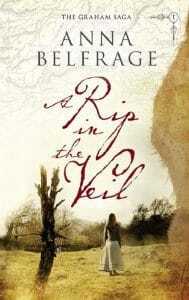 A Rip in the Veil has had several good reviews!